The thriller “The Gunman,” directed by Pierre Morel (based on the novel by Jean-Patrick Manchette) plays on the international crises in Africa, with civil war and poverty, from a historical perspective (like the 2006 film “Blood Diamond”). An aging but fit Sean Penn plays the mercenary sniper Terrier, and we actually root for him. In the opening scenes, set in the Congo in 2006 (but filmed on location in South Africa) Terrier assassinates a government official regulating mines, at the hire of the mining industry. The opening is quite striking in its depiction of the area’s poverty and decay, in an area a few hundred miles from today’s Boko Haram. Eight years later, Terrier is working for a contractor with an NGO on a humanitarian relief mission, when he is chased (along with the other workers). Back in London, he learns he is on a hit list, so he goes to Barcelona (Catalonia, thank you!) to track down his romantic rival Felix (Javier Bardem), in his palatial setup in the mountains outside the city. He also finds the former girl friend Annie (Jasmine Trinka). They get hit hard there in a home invasion, and the chase continues to Malta, and winds up in a bullfight. The gun violence is pretty gratuitous. Irdis Elba also plays a supporting character (rather CIA-like) at the end. The closing credits indicate that Barcelona has banned bullfighting since 2011. This film offers some spectacular views of the city. The official site (from Open Road and Studio Canal Madrid) is here. This film was made directly in English, which is a bit of a surprise. 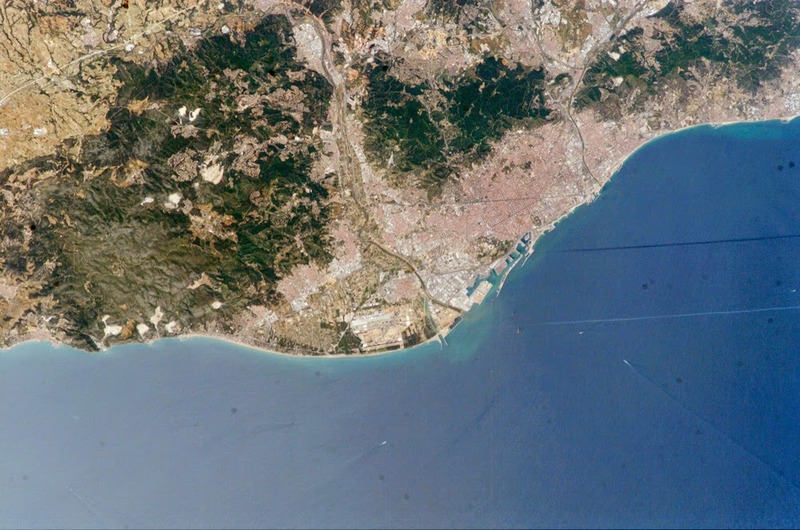 NASA photo of Barcelona (p.d. ), Wikipedia attribution link. I recall that a workplace "buddy" went there from Minneapolis for a long weekend in the spring of 2001. I would soon head for Amsterdam and then Bilbao (in the Basque area) myself.